Twitched an agile Pallid Harrier that had a brief sojourn over farmland skirting the saltmarsh on the East side of the The Fylde, Cockerham, Lancashire (17th). Nice to watch it quarter the fields after a Meadow Pipit snack or two, more on them later, as well as turning the tables on a mobbing Crow. A scan over the saltmarsh saw the now staple British Little Egret forage in the channels and Curlew and Lapwing were represented but outnumbered by noisy Redshanks. Panic set in when a Peregrine decided to put on the after-burners in search of a spot of wader lunch. 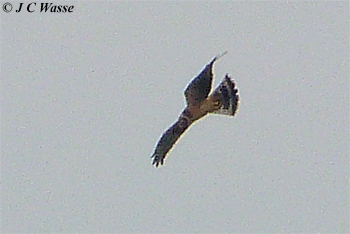 Kestrel, Sparrowhawk and Marsh Harrier also noted here. A couple of hours later I was across the marsh over at Skippool Creek racing against the incoming tide to spot the Semipalmated Sandpiper that had been present for a few days. 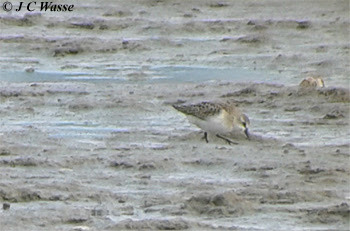 A bit of a slog around one side of the Creek to where most of the smaller waders were feeding or roosting. 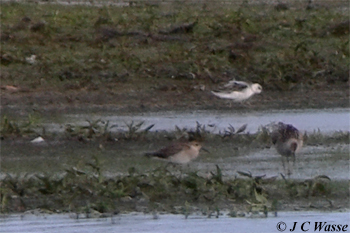 No sign of the Nearctic peep over several scans of roosting Dunlin (20). One final scan and out of nowhere there it was. I managed the following record photo and helped a few others who had now made their way over from the Pallid Harrier twitch to see the bird, before the rising tide pushed it out of sight against the near bank. Ok, it can be easy twitching other's finds as I was doing today, and the pressure can be off. From my recent experience of this species on the Eastern Seaboard of the USA, and without seeing the palmations or taking detailed notes of this individual, it did look to be a 'Semi-P' on size, shape and impression alone. Much credit goes out to those with the task in hand of writing or collating notes for submission of this individual. Old Moor RSPB the wetland reserve in the Dearne Valley, east of Barnsley, South Yorkshire. A brilliant place but it should not be taken in isolation, it's one of three main bodies of water in 'The Wath Area' collectively forming one of the best inland birding areas in Great Britain - Broomhill Flash, Wombwell Ings and Wath Ings (now a major part of Old Moor RSPB). With apologies for excluding Bolton Ings. Will always keep a 'Wath List' and this week back home saw me drop on 2 Wath ticks (Dipper and Grey Phalarope) and a 2nd for me at this site in the form of Spotted Crake. Now on # 194 for the area. 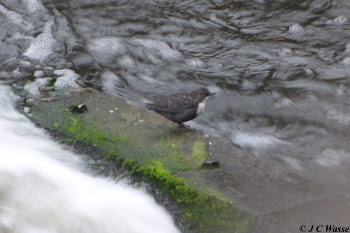 The Dipper was only the 2nd ever seen here in the Barnsley Area lowlands and first twitchable record. Less than 10 Grey Phalaropes have been seen in 'The Wath Area', this latest one arriving on a day that saw many appear storm driven inland (21st). 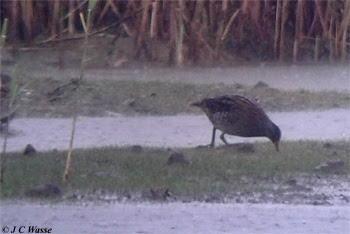 The Spotted Crake gave many a birder the runaround during this period, but showed well in the open from The Reedbed Hide during a torrential late afternoon downpour (20th). I also connected when it finally gave itself up to the masses in drier conditions as it was being booted by a Moorhen the weekend before, on the evening of the 15th. Is it a Manic Monday, a Terrible Tuesday or perhaps a fantastic Sheffield Wednesday? No, it's Mipit Saturday !!! You can't beat a bit of visible migration, vis- or is it viz-migging. Saturday 22nd September proved to be a good day for this birding art form, when every Meadow Pipit ('Mipit') in the Western Palearctic appeared to be making there way West across Great Britain. Way up on the South Yorkshire moorland edge provided a good vantage point, looking north scanning across the heather clad vista. The sky was full of dots to the horizon, literally hundreds of Meadow Pipits moving on a broad front and when in earshot giving their varied flight calls. Seeing the sky full of Pipits reminded me of Cape May's (fall) morning flight over in New Jersey, USA when the Warblers zoom by overhead, only for a look to the East out across the pond at the Higbees Morning Flight watchpoint revealing more passerines reverse migrating over the entire Point. Only then can the shear scale of such a movement taking place be truly appreciated. Back to South Yorkshire where with my dad we tallied over 700 'Mipits' in the morning and continued counts (Upland Tyke and Simmo) throughout the day logging a total of over 1,600 by close of play. The 700 of the morning was perhaps an underestimate on my part, the birds moving on a broad front making counting very difficult, it could easily have been twice that number. Not just Meadow Pipits, caught up in the movement were finches including a flock of 20 Redpolls and several Siskins, and up 70 of the latter moved north west along the chain of moorland reservoirs late in the afternoon. Not too far away as the Anthus flies, an incredible 11,000+ Mipits were noted on this day moving over Anglers CP, West Yorkshire. 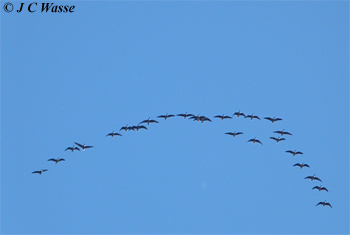 This weekend also saw Pink-footed Geese returning to their wintering grounds with several small skeins noted moving NW in the Barnsley and Sheffield recording areas. Bringing proceedings to an end on the Sunday (23rd) a pair of Merlins tormenting a group of Ravens above a moorland peak was a special sight. It was instructive to study the feisty moorland wizards interacting with the magnificent King of the corvids. With thanks to Simmo, Upland Tyke and Ivan et al for help with birding information throughout the week. More photos from the week back home at 'Latest UK Bird Photos'.